(2016-02-18, 01:40:38)asemion Wrote: You can change Nanoslider JQuery version with newest (for example with 1.11.3). And check the functioning of the plugin. Then uncheck JQuery loading from RA theme. After that, both dropdown menu and nanoslider plugin are working! A arrow_up.png is referenced but does not exist. Thank you for this theme! I noticed a malfunction with the plugin I18n. When I activate I18n, it does not appear active navigation item. Breadcrumbs also does not display the active page. How to fix it? LESS and CSS files are fixed, also remove reference for not existing arrow_up.png file (it's "Go Top" arrow reference, but actually this arrow generates from font awesome symbol without image). In order to display the navigation elements except i18n_base you must install and activate an additional i18n_navigation plugin. Plus if you want the language menu - my i18n_lang_menu plugin. Breadcrumbs also formed by i18n_navigation plugin if it's activated or from internal function if i18n_navigation not activated. Breadcrumbs structure including in the following template files: template.php; home_with_slideshow.php; nosidebar_breadcrumbs.php; contact.php and contact_with_gmap.php. Other templates breadcrumbs structure not used. So, please, check your plugins and templates files which used your pages. I changed the CSS, to get active navigation item. Вообще то CSS код меняется динамически с помощью плагина LESS. он включен в тему. Просто достаточно на странице администрирования темы поменять цветовую схему на нужную и сохранить. Файл CSS перегенерируется автоматом. Надо символ &raquo поменять на &#47 (символ бэк слаш в конце оставить точку с запятой . Ну и наслаждаться проделанной работой. Успехов. Андрей. nice work, one question is it possible to remove the sitename and description near the dropdown menue? it is possible to remove website name and add a logo by upload any image file. Site slogan (description) not showing if on the administrative page field "Site slogan" not entered (is empty). I noticed another bug. If you create a child page for the index, then in breadcrumbs creates duplicated links. It is possible to fix? Я заметил ещё один баг. Если создать дочернюю страницу для index, то в breadcrumbs появляются дублированные ссылки. Это возможно исправить? (2016-03-01, 00:16:55)newman Wrote: Hello, Andrey! Это проблема не темы, а функции get_i18n_breadcrumbs() из плагина i18n_navigation. Она не умеет правильно работать с такими ссылками. Сейчас я работаю над новой версией темы Red Agency, в которой будут реализованы обнаруженные недостатки. Скоро я поделюсь этим обновлением с сообществом. Main menu items, which has subsidiaries elements can now be clickable. Site Breadcrumbs now fully adjustable. For this used its own functions that shape the breadcrumbs as on single language sites so containing i18n structure. Functions correctly works with the first menu item child elements without duplication. You can use any symbol between the elements, as well as icons classes from specialized fonts (eg. Font Awesome). Breadcrumbs elements inserted between the span element with 3 kinds of classes: "breadcrumb-home", "breadcrumb-menu", "breadcrumb-current". So, you can decorated them using CSS as you want. All used in the theme resources (fonts, scripts, images, etc.) place locally. So, the theme will works in local networks without Internet access. In the Theme setting page insert a new management field "Load Jquery in Header". Useful in order to prevent conflicts with plugins that are loaded their scripts in the Header area. Is it possible to correct a little menu for mobile screens? Submenu is not displayed when you hover. (2016-03-08, 23:59:34)newman Wrote: Огромное спасибо, великолепная работа !!! А можно ли немного подправить меню для мобильных экранов? Не отображается подменю при наведении курсора. Перезагружаем сайт (для того, чтобы перегенерировался файл CSS). Смотрим, что получилось. Да, если у Вас будет время, то проверьте как это будет работать на тач скринах. Если все будет хорошо - тогда я внесу изменения и в саму тему. (2016-03-09, 21:19:28)asemion Wrote: Почему-то не работает. Возможно скрывается какой-то блок. идет в блоке, который срабатывает только когда активирован компонент Carousel. Или перенесите код в область глобального действия например на линию 71. 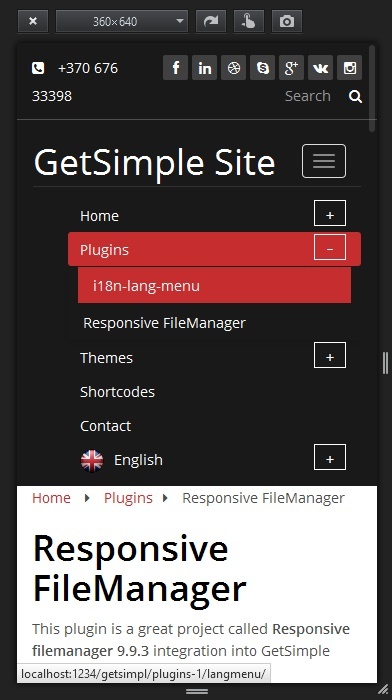 There is a plugin for the mobile menu jQuery plugin. I don't know how to use it. For testing responsive interfaces (GUI) you can use the tool Firefox: Ctrl+Shift+M. (2016-03-14, 02:12:02)newman Wrote: Да, работает, но не так, как бы хотелось. Я нашел возможно подходящий (клик разворачивает подменю и активирует ссылку на родителя) jQuery плагин, но вот подключить знаний не хватает . Плагин - интересный, но проблематичный, особенно когда его надо встраивать в тему (темизация) - ломает всю структуру темы. Попробую сделать сам то, что он делает, только без подключения личных кодов плагина. Только на это надо не много времени. Improved responsive code for mobile devices. Improved the main menu generation code for mobile devices. Please guys, English is the language of this forum. If you write in another language, at least you should post a translation. (2016-03-22, 06:33:25)newman Wrote: Я готов зарегистрироваться (в любой соц. сети), чтобы Вы мне объяснили +и - и тд. Где надо и когда? It seems to me enough to write empty words. If you do not have anything to say about the theme - better keep quiet. Improved gallery component code (required component re-import). Add sites logo image. It can be managed on the administration page. Add thumbnail images prefix management (for image galleries creating). You can set it on the administration page.